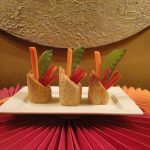 Savory Ficelle bread is baked, cooled and sliced on an angle on one end to create a small cup filled with 1 tablespoon Ranch dressing and sliced fresh vegetables as an appetizer. The bread loaves are skinny crusty baguettes with a coarse crumb and perfect with salads and Italian meals. A long skinny crusty bread made from yeast and flour, used for Crudité cups, cheese toasts and side bread for French, Italian-Mediterranean dishes. Easy to make and bake. If you can’t find the ficelle pan, use a French Bread pan. Put 2 cups flour and salt in food processor, blend for a few seconds. Dissolve sugar in hot water, when temperature is correct add yeast. Let proof. Add proofed yeast to flour. Process for 20 seconds. Touch dough; if it sticks add more flour 2 tablespoons at a time. Repeat if necessary. With oiled hands remove dough and knead about 20 times. Divide dough into thirds, roll with hands into long ropes. Rolls should be 1 inch shorter than edges of ficelle pan. Grease ficelle/baguette pan with cooking spray. Place pan in cold oven for 35-40 minutes to rise. Turn oven to 400 F. Place a Pyrex bowl with boiling water on floor of oven. Mist the bread with water all over. After 5 minutes of baking mist the bread again and then again 5 minutes later. Appetizer cups: The bread is baked- cooled and sliced on an angle on one end to create a small cup. The inside of the bread is pulled out leaving the bottom in tact and filled with dressing of choice and sliced veggies. Toast the cups under the broiler for a few minutes to create a crusty bread cup. Cut the cups 3″ widths then angle one end. The width of the bread is 1 to 1-1/2″. These skinny loaves are crusty and delicious, perfect with all salads and Italian dishes. The Ficelle Bread baking pan is a baguette pan. 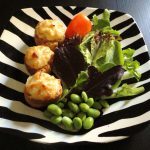 MAKE FICELLE CROUSTADES- A CHEESE FILLED APPETIZER- RECIPE FOLLOWS. The ficelle bread baked and cut into 1″ slices, toasted on one side and filled with cheese filling. 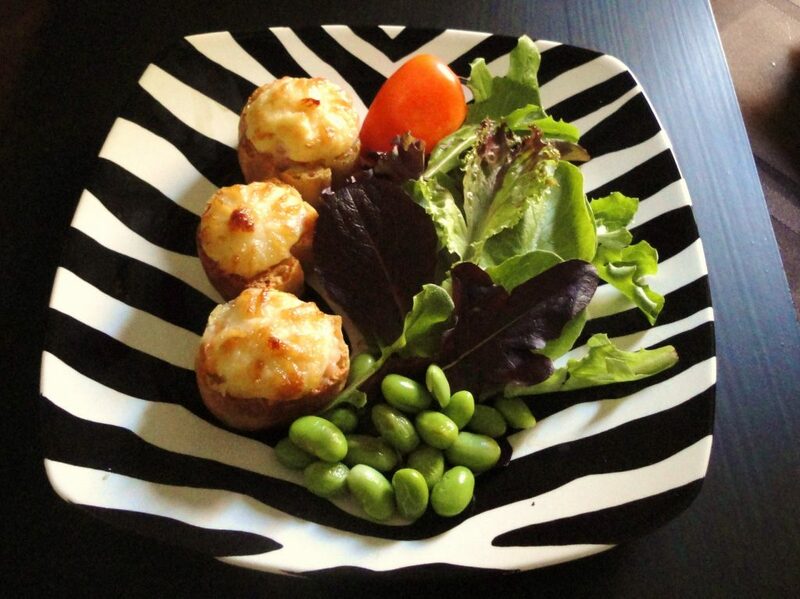 Delicious with salads or as mini appetizers. Cut Ficelle bread or any skinny sourdough bread into 1/2″ slices. Toast one side only under broiler about 4 minutes. Drop oven temperature to 400. Using your fingers, hollow out the un-toasted side of bread to form a shell and place on parchment lined baking sheet. Set aside while making cheese filling. Cream softened butter, bacon and cheese together in small mixing bowl. Set aside. In separate bowl, mix mayo, onions and Parmesan cheese together. Set aside. Fill bread shells with butter, bacon, cheese mixture half full. Top filling with mayo, onion and Parmesan cheese mixture. Bake croustades at 400 degrees for 10 minutes until browned. Croustades or filled cheese bread can be made ahead and frozen until ready to bake. Thaw before baking at 400. 10 minutes. Can be refrigerated up to 2 days.